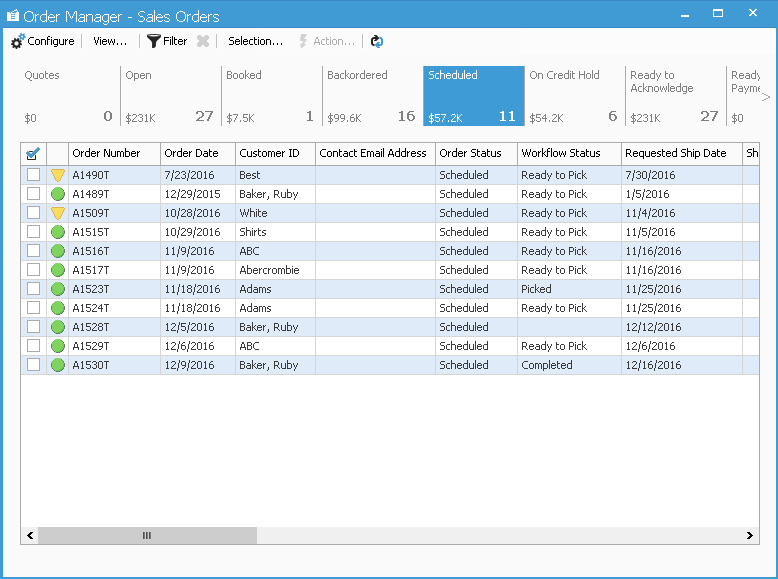 The Sales Order Manager is a management window in Acctivate that allows users to filter and process batches of Sales Orders in one central location. The Order Manager also provides a quick overview of the value of your sales in different workflows and statuses. 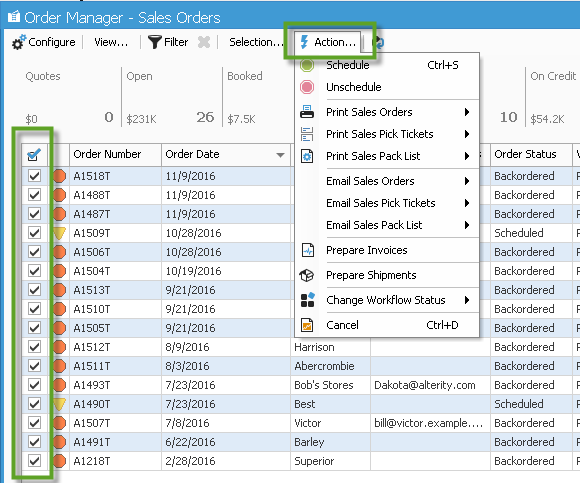 The Sales Order Manager offers a number of different filters and views. On the toolbar, if you select the “View…” button, you can see three standard views available. The “View…” button will also list any custom views users may have created. Click here to learn how to create a custom View. The “Filter” button on the toolbar allows you to further filter down the selection of returned Orders in a specific View and group. 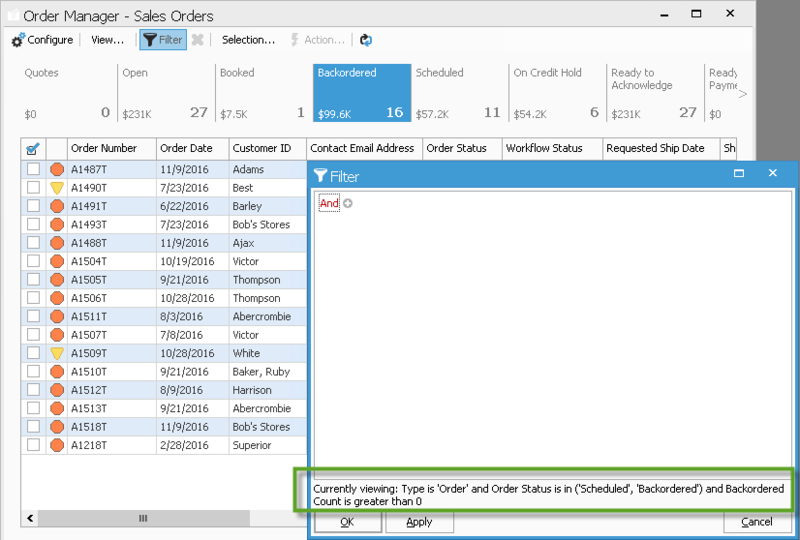 In the screenshot, below, the Sales Orders view is selected and the Backordered button is selected, which includes the group of open Orders that have either backordered items or the status of the Order is “Backordered”. When I select the “Filter” button, you will also see the “Currently Viewing” caption at the bottom of the Filter window. This explains the selection of Orders currently being displayed. To learn more about how to create a filter, click here. When viewing the selection of Orders, you can also quickly change the sorting of the records by clicking on any of the field columns. 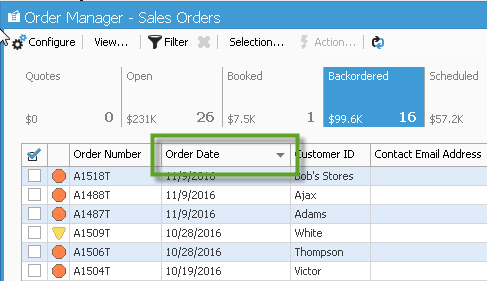 An example of this is if you want to view Backordered Sales Orders sorted by date, you can click on the “Order Date” column to sort the selection by the Order Date descending. Click on the column, again, to change the sort in ascending order. The Action toolbar button offers a number of different ways to process your Orders. If I wanted to schedule a group of backordered Orders, I would first select the checkbox next to the Orders in the view. You can either manually check the checkbox next to each Order or you can filter the selection to gather the list of Orders you want to schedule, then select the “Selection…” button on the toolbar to “Select All” or “Check Selected”. Change Workflow Status – Allows users to change the workflow status on the selected group of Orders.